Everybody loves to see the vintage trailers, especially the polished ones. So every year at the International Rally one of the most popular events is the Vintage Open House, where all the “vintage folks” open their trailers to anyone who cares to come in and look around. This is always a superb opportunity for photography, but I have to admit that the wilting heat (97 degrees) and humidity and gnats definitely put a damper on my efforts. 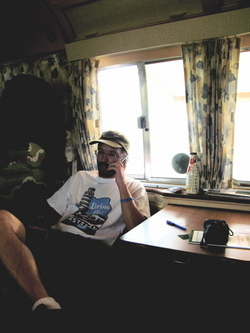 I spent a lot of time hiding inside the air conditioned trailers. But one thing that made it worth coming out into the heat was Vince and Lonnie’s jambalaya, which they had started cooking early in the morning and were serving to all visitors. You never go hungry when you’re camping with them. 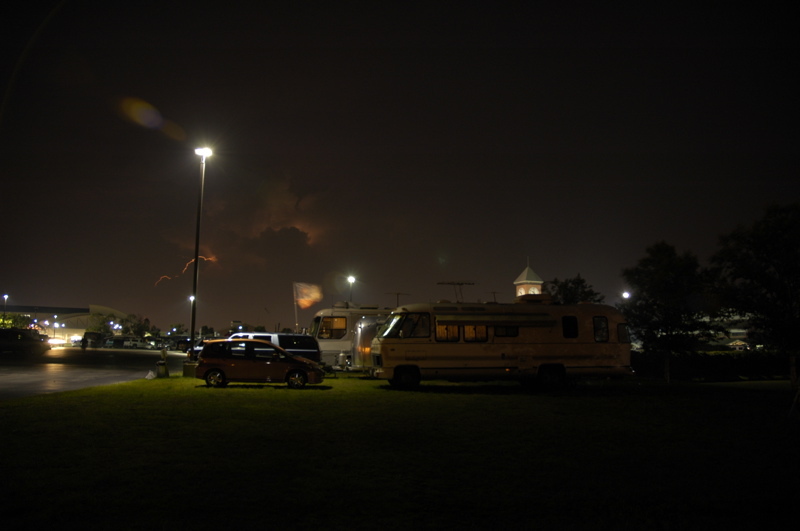 This evening thunderstorms circled the fairgrounds and lit up the sky for hours without giving us any rain. It made for dramatic lighting over the field of silver trailers, and a nice show. The breezes that came with them kept the gnats down, too. Wandering around the vintage area late this evening, I found a group of people watching “RV” on an outside screen, and the group below yakking it up about the events of the day. Everyone seemed to be in a great mood … happy to be here, happy to have a cool evening, happy about the way things turned out today. It is hard to see how people are managing to thrive in this climate without air conditioning, but some are, including our very durable friends the Fabers. This is much tougher than southern Arizona at 105 degrees. Last night several of us guys were talking until nearly 11:30 under the awning at Colin’s, swatting at gnats and constantly sipping at cold drinks. Sitting there in the light of a single bulb, watching small beads of sweat coming down the faces of my friends, I suddenly had a moment where I imagined we were all British officers in colonial Africa, passing an evening at the Club by telling outrageous stories on the patio, and wondering secretly when we would all be back home. That’s when I knew it was time to get to bed. 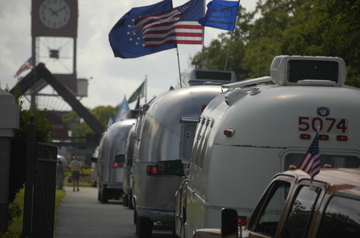 A perennial part of every International Rally is a display of new Airstream trailers. The closest dealer(s) bring a bunch of their inventory over for anyone to drop by and check out. It’s free, no pressure, and a great way to compare floorplans and interiors. 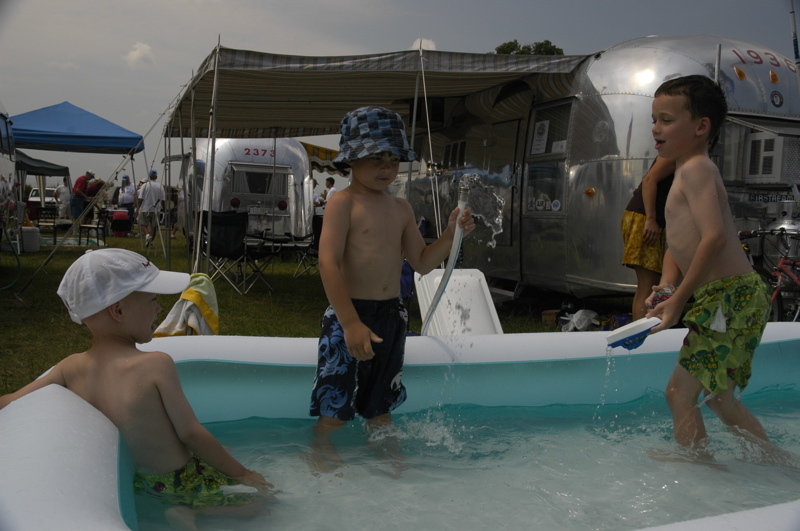 This year about two dozen trailers and motorhomes are on display, but unfortunately they are parked outside in the relentless heat and humidity. With that in mind, we decided to make our visit early in the day. Even in the relative cool of the morning, we didn’t exactly have to fight a crowd. I suspect there will be quite a few more people dropping in over the weekend, however. 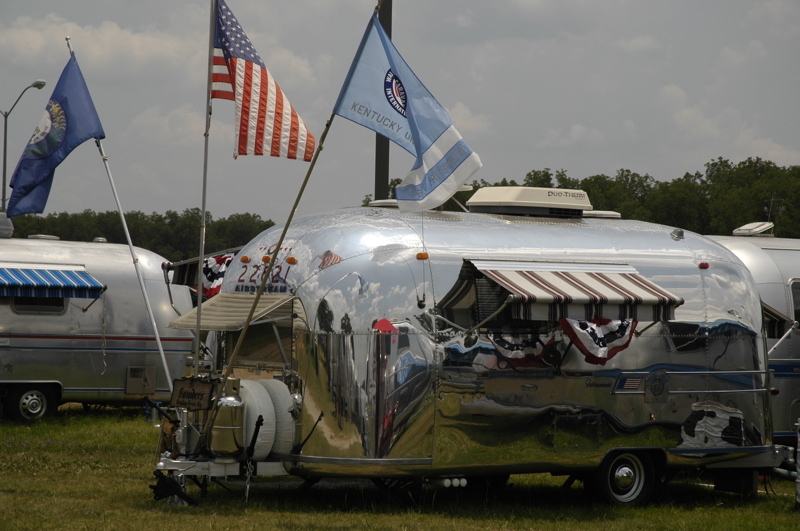 The President and the Chairman of Airstream were both there, completely available to anyone who wanted to talk, so it was a superb opportunity for anyone interested in the product to get a personal tour. We snagged them for a while to talk about what we were seeing. As I reported from the dealer meeting a few weeks ago, the trend in trailers is smaller and lighter. The popular floorplans are the 25FB (front bedroom/rear door), the similar 27FB, and the 19-foot Bambi. 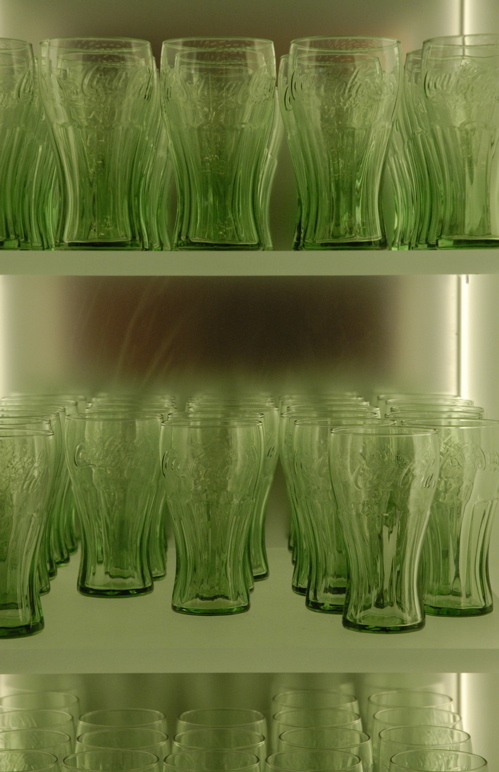 A few intermediate sizes are also looking good in the 2008 line. We checked them all out before the heat became too much, and then retreated into one of the air conditioned buildings. Later we had a meeting I have been looking forward to all week. 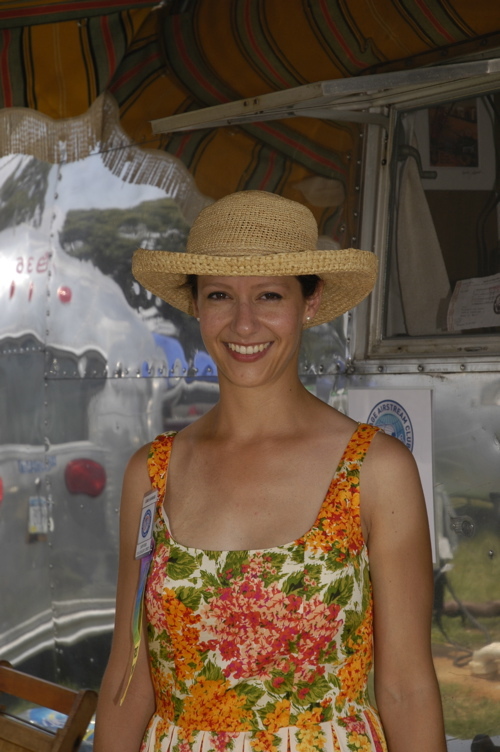 We’re going to introduce a new advertising section of the magazine solely for Airstream Parks. 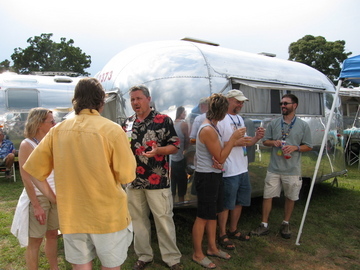 We brought together as many of the Airstream Park representatives as we could, explained the super discount offer, and got a great positive response. It looks like this section will be a Go (as in, “The Fit Is Go!”) If you represent an Airstream Park and didn’t know about this, get in touch with us ASAP so you can participate. In yesterday’s blog I mentioned that we’d been invited by the Dixie Campers to join them for dinner, but I mistakenly said Saturday night instead of Friday night. Fortunately my head was re-attached this morning and I got the date straightened out in time to join them. 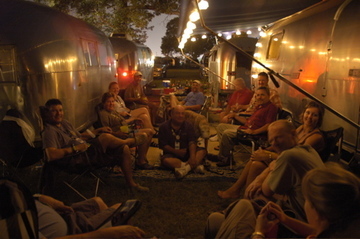 After all, the most important element of an International Rally is socializing. Alas, the gnats came after us in wave after wave, and for some reason they were less intimidated by the bug spray today than they were last night. The little winged annoyances were landing in our spaghetti sauce (sampling? ), in our ears, our eyes, and industriously forming small clouds around us. They seem to love the heat, and it was very hot and very humid. Adam, Susan, Brett and I lasted only about an hour before surrendering and retreating back to the cool bug-free interior of the motorhome for the rest of the evening. It’s a shame because we didn’t get to spend much time with Vince, Lonnie, and the rest of the Dixie Campers tonight. We will have come up with a battle plan so that we can survive the Vintage Open House (11 to 3) on Saturday. 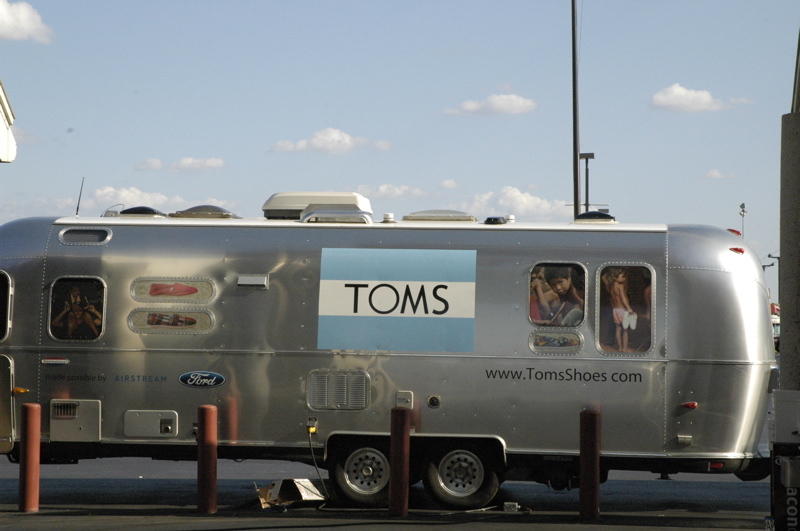 During today’s speeches from the Airstream head honchos, a company called “Tom’s Shoes” was introduced. Tom’s is a recently created company that makes a simple, “earth-friendly” shoes. For each pair of shoes sold, the company donates another pair to a child in need — and there are surprising number of people in the world without shoes. Tom’s first “shoe drop” donated 10,000 shoes in Argentina, and Blake says they will donate 50,000 shoes this year. 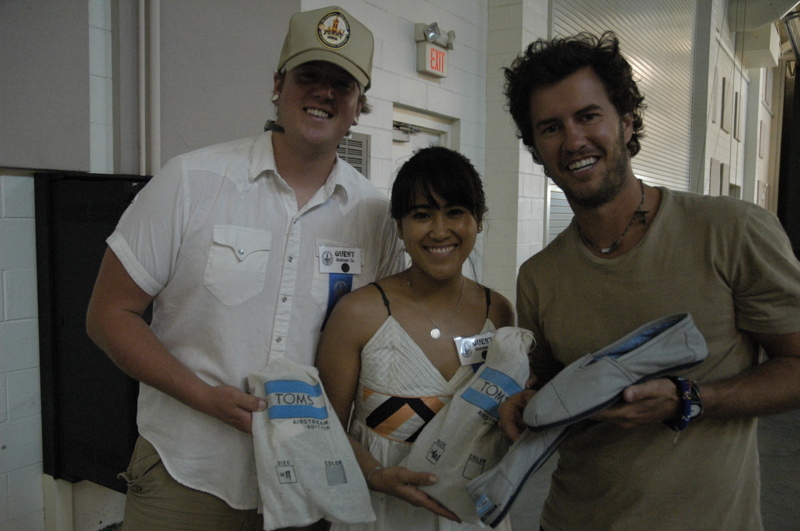 Airstream donated the use of a trailer to allow the Tom’s staff to roam the US and sell shoes, and so today Blake Mycoskie and some other folks from Tom’s were here at the rally to promote a limited edition “Airstream” shoe ($48.00). The rest of today’s rally events are a mystery to me. I missed everything. Brett and I spent the entire day in meetings, and we’ll do the same tomorrow. Just as the rally is gearing up, our playtime is over. But in the evening we were able to break away to visit the folks in the vintage section — where the real fun is. We found our friend Shari Davis (1st vice president of the Vintage Club), Leo Garvey, Colin Hyde, Pete Daniels, and a few other folks, plus I got to meet Dave Morrison for the first time. He’s a new freelancer for the magazine, so it was great to put a face to the name after a few months of working together. 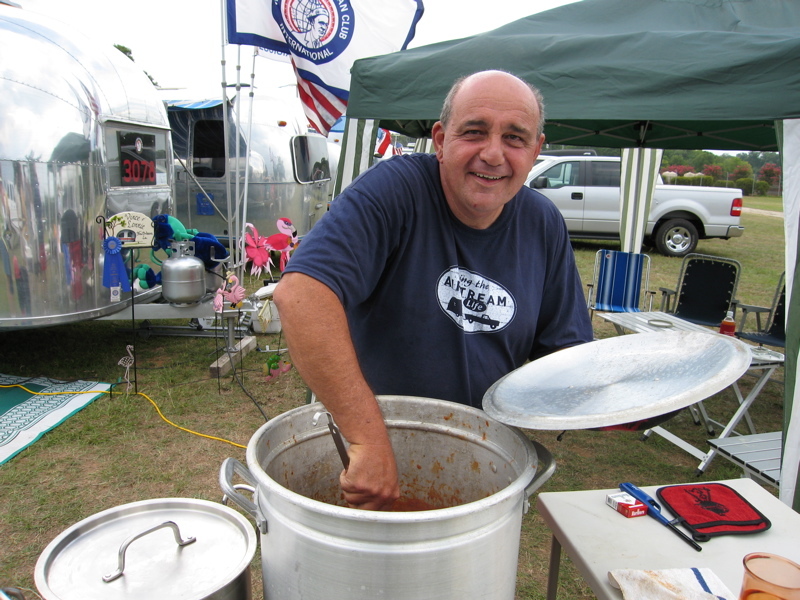 We even managed to score an invitation to dinner with the Dixie Campers for Saturday night. One meal of their cooking will make up for a day of meetings, I’m sure. Even with a full schedule of work we’ll manage to get some good times out of the next few days. We started off today with the Vintage Parade. 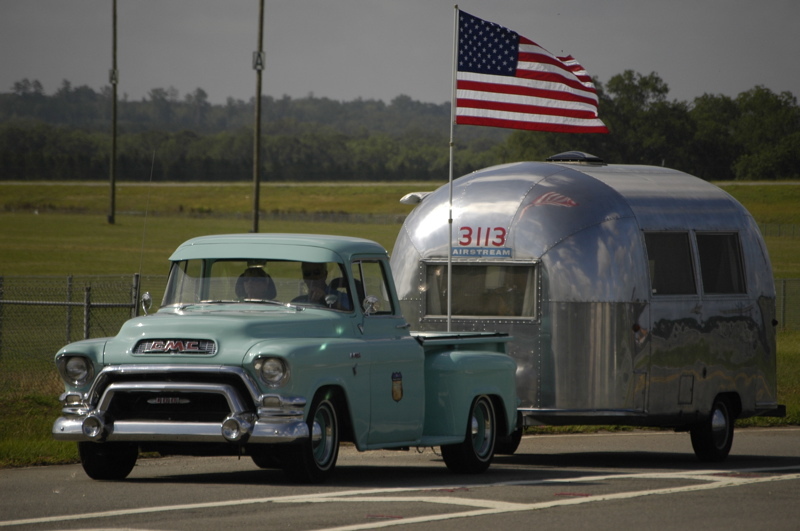 It’s a tradition at the International Rally for the vintage club trailers to all arrive together. They go through a lot of trouble to make this happen, including staging all the trailers the night before at an off-site location. The parade only takes a few minutes but it’s a proud moment for all the owners and great to watch. Being a vintage Airstream owner myself, I knew a lot of people in the parade. 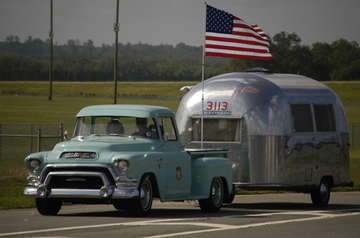 Above are our friends from Arizona, Ken and Petey, arriving in their 1955 GMC truck and 1964 Airstream Bambi II. Today was our last chance for a roadtrip to Atlanta, so we hopped in the Fit and headed north. 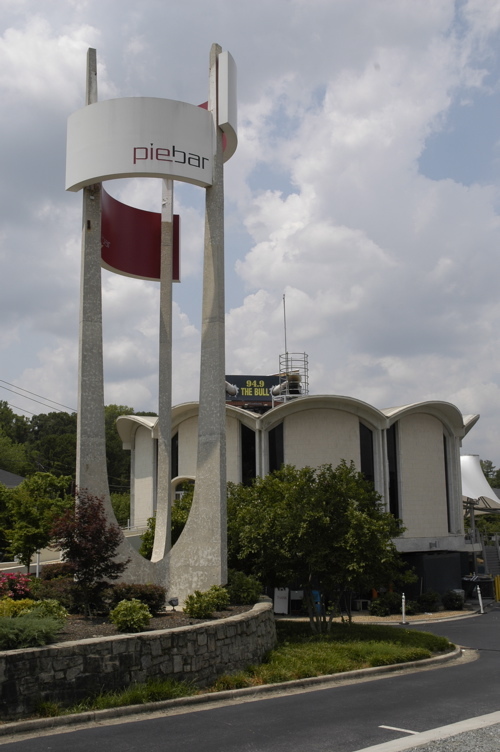 Brett and I met with Wendy and Bill at a pizza place off I-85 called the Pie Bar. The pizza’s very good, but the real attraction for me was the unique architecture of the building. 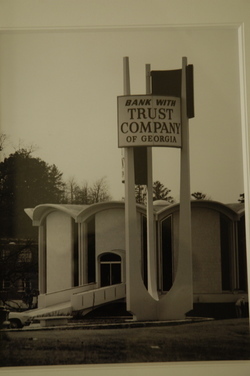 It’s a round building with glazed blue brick and terrazzo floors, which was formerly the Trust Company of Georgia. We also took in the World of Coca-Cola, which is now located in a much larger building (since May 2007) and also costs a lot more. It’s $15 now … but hey, they have a Epcot-center type ride in there. And they still give you all the soda you can drink, which in my case isn’t anywhere near $15 worth. The sort of business I am in often seems to have nothing to do with publishing. In fact, most of a typical work day is spent doing things other than editing articles and working with freelancers. I seem to spend a lot of time managing relationships, both business and personal, to grease the wheels of the magazine’s operations. This isn’t what I expected to be doing when I started this business, but it is critical. A publisher is in one sense a social butterfly, a political gadabout, and the willing recipient of gossip and gladhanding in the cause of getting the story. Being a small businessman, I’m also on the hunt for bargains, constantly seeking people with new ideas, and trying to listen to the winds of change. This isn’t the sort of work one can do effectively sitting at a desk. Once in a while you have to get out and talk to the customer, and meet with the politicians. So I have begun making the rounds of social and political events that are the core of every major rally. But if this all sounds lofty and prestigious, rest assured I experience the same humble moments as our hundreds of aluminum-clad neighbors. The day began with the unsubtle rumble of the pump-out truck sucking sewage from a row of trailers at 7:30 a.m. By happenstance, they chose to park the truck directly outside this motorhome as the job was done. Not exactly as romantic as being awoken by the chirping birds in a state park somewhere. Ah well. Time to get up and get to work. Each day typically starts with a series of emails and phone calls, clearing up leftover issues and setting the stage for the days ahead. Then we head out to meet with potential new advertisers and sniff around for possible photo opps or stories for future magazines. Brett and I had lunch with a very interesting group: Fred and Renee (representing the club’s Communications Liaison), Leo Garvey (representing the “Save Wally” organization), and Paul Waddell (the president of our home unit, Washington DC). There are some incredibly bright and capable people in this club and I always get a kick out of hearing what they have to say. In Perry’s two-block restored colonial downtown, there is a real barbershop. Real barbershops are getting hard to find, and when I see one I always go in for a haircut. Not only do I usually get a good haircut, but I get a piece of Americana to see and experience first-hand. The best ones are like the one in Perry, where even the furnishings take you back a few years and put you at ease. 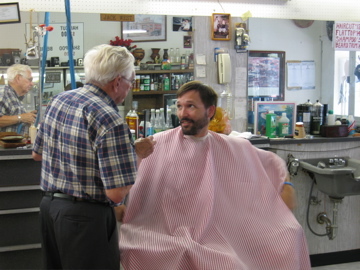 The fellow who cut my hair has been in business in Perry for 57 years. That’s experience you can count on. I told him, “Just cut it. I will trust your judgement.” Brave? Foolish? Well, I got a nice (short) haircut for $12 and I don’t regret anything about it. That’s a lot more than I can say after visiting many of the haircut chains. Whlie at the Vintage happy hour today I got a call from some friends we met in Idaho last summer. We haven’t been in touch since then, but they saved my number and called today to say they were coming up to Vermont this week. 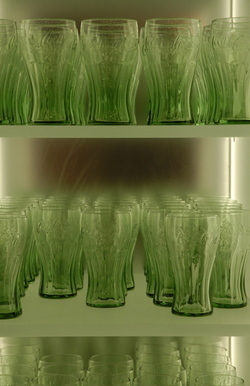 I put them in touch with Eleanor and they arranged a big meeting for Thursday at the lake. This sort of thing absolutely delights both me and Eleanor. Making long-distance friends is a perk of the lifestyle, we think. I even like the fact that they spontaneously got in touch while they were driving through Connecticut. Sure, it might not have worked out, but the chance that it could made it worthwhile. I think they were flattered that we remembered them, and we were flattered that they got in touch after a year. 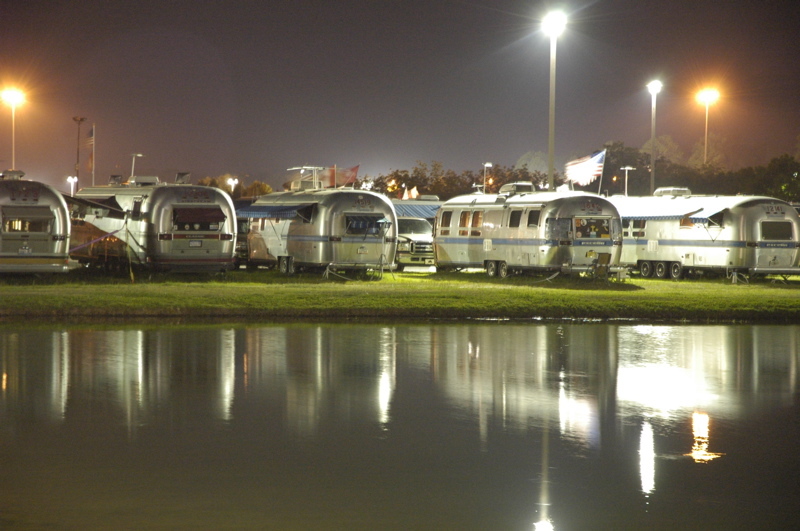 It looks like over a hundred Airstreams arrived today. The “silvery tapeworm” of Airstreams began to snake down the access road to the Fairgrounds as the parkers worked to get them settled. 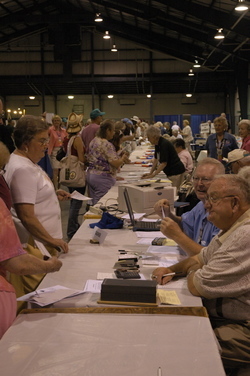 The vendors opened up their stores, and registration officially began as well. This rally is getting under way. We spent most of the day running into people and catching up. Imagine Brett and I riding around the fairgrounds on our bicycles and getting stopped every few hundred feet by a cry of “Hey guys!” Each stop meant ten minutes of conversation (“Where are Eleanor and Emma?” “How’s the magazine?” “Where are you parked?” “Have you seen my new trailer?” etc.) but it was all fun. Every day there is a chance of thunderstorms. In the afternoon today we had a threatening sky and high winds, but no rain. Still, the steady wind was enough to deflect Brett’s flagpoles far enough that they touched the front of the motorhome, which was his trigger to take in the awnings and flags. A fast moving thunderstorm would easily destroy awnings all over the fairgrounds. Today it just lowered the temperature to about 80 and made the evening air rather pleasant. In the interest of discovering the “real” central Georgia, we did some research online. Local food is always a priority for me, so I searched for something authentic and well-respected. I found Fincher’s Barbecue in Macon, about 30 minutes north of here. FIncher’s has been in the same old neighborhood in Macon for about seventy years. It looks like a delapidated drive-in restaurant (which it is), and the neighborhood isn’t great, but the food is legendary. 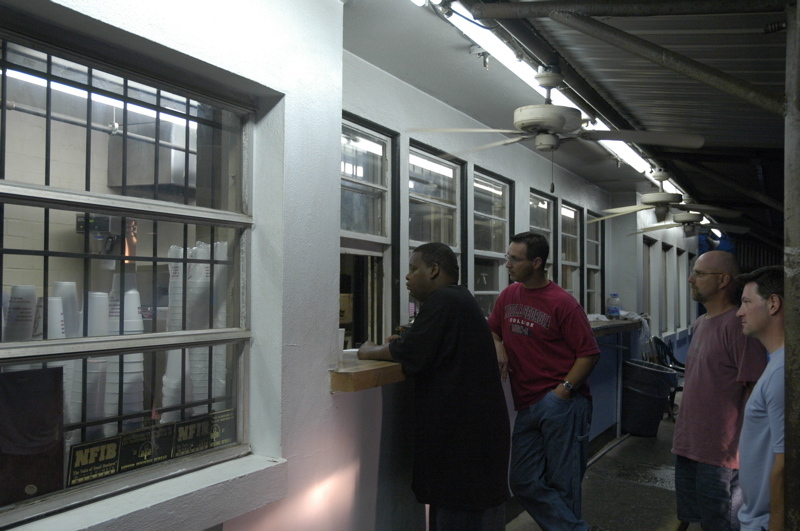 While waiting for our order to come up, we talked to a fellow who said his mother used to come here, and he had such great childhood memories that whenever he was in the Macon area he stopped in for dinner. That’s exactly the kind of story that I read on the Internet that brought us here. Tonight Fincher’s was serving only take-out, so we loaded up with two pounds of barbecue, some cole slaw, and Brunswick stew (a local variation on barbecue). All of this came back with us to the motorhome and we served it up with bread for late dinner with Colin Hyde. Now I’m happier — we have put a little knowledge of the area in our brains, and a delicious sampling in our stomachs. To me, this sort of event is what really kicks off the rally. We’ve been researching things to do in the central Georgia area since my blog of last night. Denese Lee, a friend from South Carolina who is here at the rally with her husband David, read the blog and took issue with my statement that there was little excitement in Perry. She recommended the local Museum of Aviation, which is located about 20 miles away at Warner-Robins Air Force Base. Funny coincidence, since I got Denese’s email about an hour after we had spent most of the day at exactly that place, with Fred and Renee. 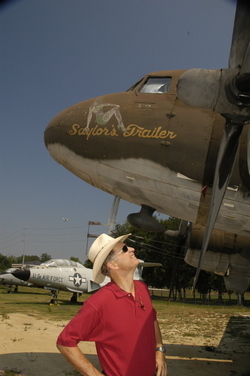 The museum is very good, with dozens of aircraft and other excellent exhibits. The fact that it’s completely free is a huge bonus. 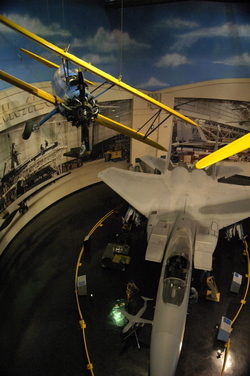 The exhibits include five buildings full of aircraft (including a SR-71 and B-1B bomber), several acres of aircraft outdoors, a theater, and exhibits on the Flying Tigers, Art of Flight, WW II, Korean War, General Robert Lee Scott, Jr. (a native son of Georgia and military hero), and several other topics. For aviation and military history buffs, this museum is well worth the small detour off I-75. 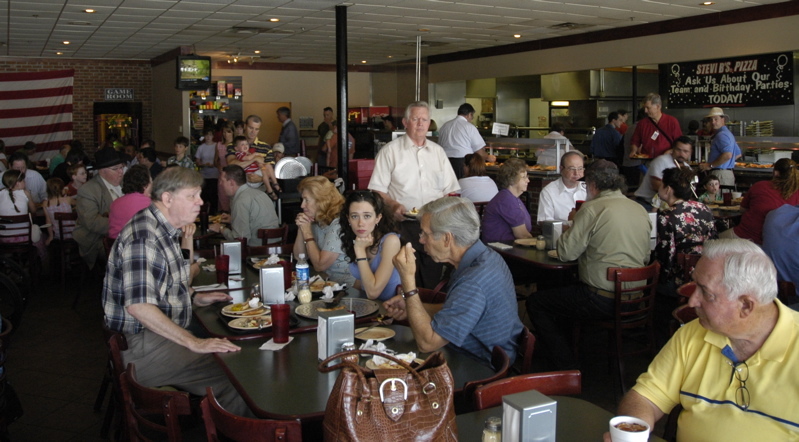 We stopped off for lunch at an “all you can eat pizza buffet”, a sort of restaurant I’ve never encountered before. I snapped a quick shot of the lunchroom before sitting down and later discovered that someone was checking me out as I did it. Sometimes that happens. It’s always fun to find these little surprises when I’m reviewing photos on the laptop later. 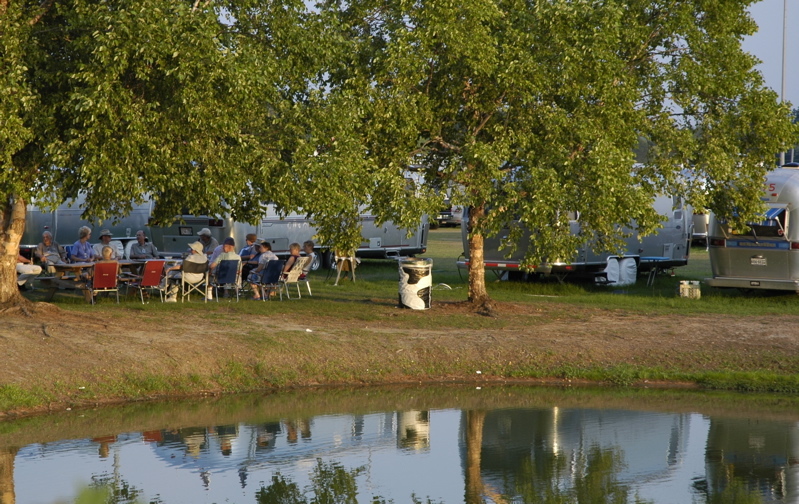 Back at the rally grounds, not much seems to happen in the searing heat, but once the sun begins to set, people appear in groups near the Airstreams for the evening happy hours. This is a rally tradition that won’t stop despite a few gnats and high humidity. Things are slowly gearing up for the bulk arrival of the rest of the Airstreams, which should begin on Tuesday and Wednesday. The quiet period of the rally is about to end.